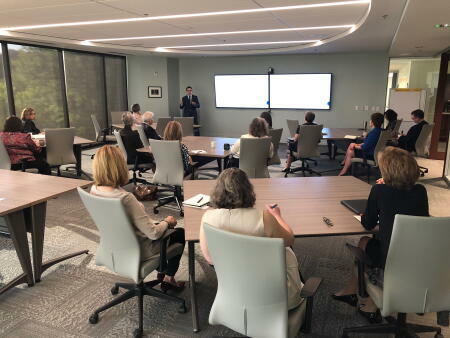 Jeff Hamond of Van Scoyoc Associates (VSA) spent some time talking with staff, board and fundholders of the North Carolina Community Foundation and the Triangle Community Foundation at a recent breakfast meeting at NCCF’s headquarters in Raleigh. Hamond was there to talk about the expected and potential impact that the new tax laws will have on philanthropy and charitable giving. He heads up VSA’s philanthropy practice, which concentrates on community and private foundations through the Community Foundations Public Awareness Initiative or CFPAI. As far as tax reforms, Hamond said a fair question was: “Is the charitable sector over-reacting?” While it is too soon to tell, he acquiesced that changes to charitable deductions could certainly serve as a dramatic disincentive to charitable giving. “Time will tell,” he said. Hamond noted that the news for community foundations was better than the nonprofit sector as a whole. He pointed to a few trends to watch. Changes affecting private colleges and universities that will require a new excise tax on endowments of a certain size could ultimately impact community foundations if expanded to other entities. Hammond, who has spent a good part of his career in DC concentrating on economic policy, said there is not widespread understanding “on the Hill” of what a community foundation is and a lot of confusion about donor advised funds. His section of VSA was created to serve, in part, as a resource for how to communicate about the foundation sector to elected officials. For more on tax reforms, visit this page.